NOTE: SPYDER'S DO NOT COME STANDARD WITH A BELT TENSIONER, PLEASE VERIFY IF YOUR SPYDER HAS OEM TENSIONER BEFORE PLACING YOUR ORDER. IF YOUR SPYDER DOES NOT HAVE SAID TENSIONER YOU CAN ORDER COMPLETE TENSIONER KIT FOR YOUR RT / F3 MODELS. THIS WOULD INCLUDE THE OEM TENSIONER AND THE UPGRADED ROLLER. We have redesigned the roller for the stock BRP belt tensioner that allows two larger bearings and a larger roller to reduce the rpm that the roller spins. No more worrying about the stock roller failing and stranding you on the side of the road. Not to mention the cost of a new belt ($310.00). The idea is to be able to give you a cost effective alternative to what’s available now. We are offering just the 2.0 roller by it's self or as a complete kit using the factory belt tensioner. LG-1065-F3 Fits all F3 models. LG-1065-RT Fits 2014 and newer RT models. Just pick your option above and add to cart!!! It was easy to install and is working great . Promptly received. Easy to change out. Works great. Nice design easy to install . I can't believe that this idler isn't std. Equipment. What a difference it makes on my RT. The vibration is 98% gone Lamonsters price for the OEM part w/ mod is great compared to the other aftermarket models out there. I'm sure they work well, I just couldn't see paying the extra money. What a difference! Smooth City! No more belt vibrations at highway speeds! Easy to install, reasonably priced, and well worth it. The vibration that my 2017 RTS has had since day 1 is GONE! I love it. 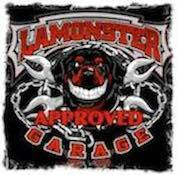 Thanks Lamonster Garage!!! Easy install. Great design. Makes it so much nicer at any speed. Highly recommend.